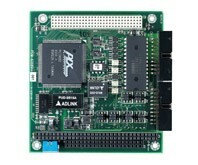 ADLINK's PCM-6308V+ is a high-performance, 12-bit analog output module with PC/104-Plus interface. It provides 8 identical voltage output channels, with each channel capable of bipolar voltage outputs, unipolar voltage output and unipolar 0 to user defined voltage output. The PCM-6308V+ provides good monotonicity, low distortion, and low differential linearity error over long periods of time. The output ranges of the PCM-6308V+ are bipolar -10 to +10 V, unipolar 0 to 10 V and as well as user-defined ranges with external reference input, which are jumper selectable. Incorporating the PCI bus within the industry proven PC/104 form-factor brings many advantages including fast data transfer over a PCI bus and high reliability due to PC/104's inherent ruggedness. ADLINK PCMI- 6308V+ device provides flexible and isolated analog output functionalities and are suitable for ATE, signal generation, industrial process control, servo control and other industrial control applications.